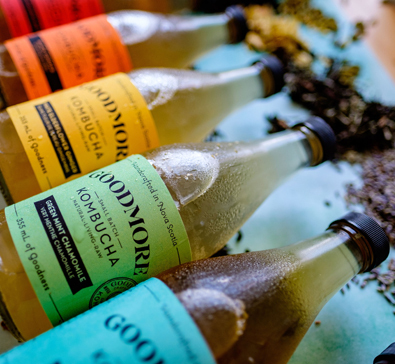 Goodmore Kombucha | Halifax Seaport Farmers' Market Ltd.
Made by hand in small-batches, Goodmore Kombucha offers a range of thoughtfully crafted and inspired flavours. Starting with carefully sourced teas, we add natural botanicals with a light-touch, ensuring our raw living brews are decidedly tea-first. Each flavour is individually fermented and never diluted with fruit juice giving a pure flavour that stands out among the crowd. Brewed on the shores of Lake Banook in Dartmouth, our small-batch ferments celebrate their natural ingredients and offer an uplifting and refreshing flavour that will bring a little more goodness to your day!